All deposits to your Mpesa account are absolutely free. You will similarly not be charged when you purchase Safaricom airtime using Mpesa. Distinctly, you won’t pay a shilling for Mpesa registration, and there are likewise no charges for the production of Safaricom Mpesa statement- that much we know. In this comprehensive post, we highlight the new tariffs and rates that you’ll be paying for your Mpesa transactions. Nevertheless, Mpesa transactions are a separate case altogether. The amount of money that you will be charged as Mpesa rates for withdrawal and transfer range according to the total amount of money you want to transact. The maximum cash amount you are allowed to send via Mpesa is KShs 70,000 for each transaction. Furthermore, the maximum Mpesa (daily) transaction limit lies at KShs 140,000. Note that according to Mpesa rates newest changes, you will pay an additional charge to send cash to non-registered Mpesa customers. From the table of Mpesa rates Kenya 2018 provided below, you will see that you cannot withdraw an amount of money that is below KShs 50 from Mpesa. However, you can send any amount that is beyond KShs 10 to other Mpesa users for free. 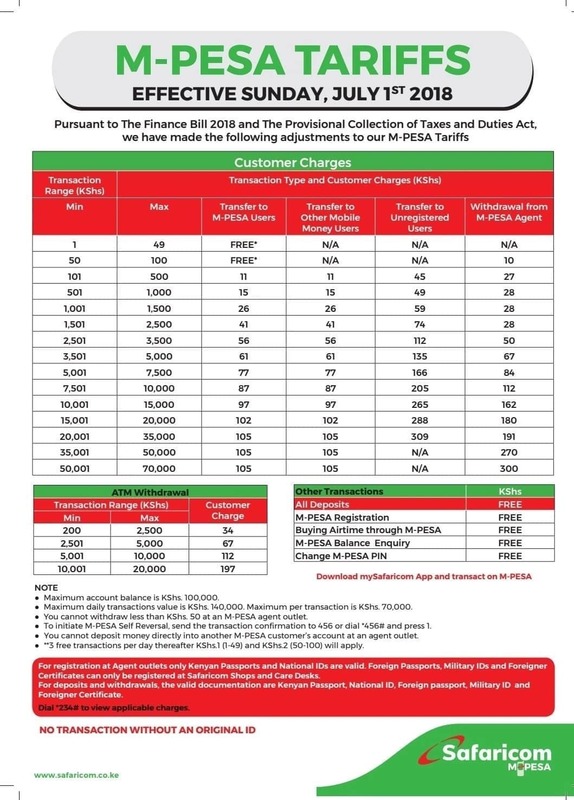 The Mpesa rates table below highlights the amounts you will be imposed for each transaction. The maximum amount that you can have in your account is KShs 100,000. For you to carry out any transaction, your Safaricom line, as well as your Mpesa account, must be registered and active. You are not entitled to deposit cash directly to another person’s Mpesa account at a Mpesa agent. To transact or register at any Mpesa agent, you will need to provide your original identification including passport, national ID, diplomatic ID, military ID, or foreigner certificate/Alien ID. The present Mpesa sending charges offer users the choice to pick from more bands if you want to transfer cash via Mpesa. The Anti-money laundering scheme established by the Central Bank of Kenya, also known as Know Your Customer policy, restricts transfers of amounts exceeding KShs 35,000. Moreover, note that this amount, as well as all Mpesa rates in Kenya, remain the same even with the tariff changes. Step 1: Forward the business transaction number to 2530 via SMS, and verification will be sent back to you in seconds. Enter the wrong Transaction ID (the one relating to the erroneous deposit). Make sure you have it ready to avoid repeating the process. Note that speed is essential when doing all these. Call the customer care agent immediately on 234 with the reversal request. You will be asked a few questions which you should be able to answer. After this verification, you will be advised by the representative on the current state of the transaction and whether or not it will be possible to perform the reversal.